A Conjoined Wealth Fund (CWF) is a privately-owned investment fund (account) or group of funds composed of financial or physical assets such as property, precious metals, stocks, bonds, or other financial instruments. Conjoined Wealth Funds invest capital globally to leverage global growth opportunities while maintaining stringent domestic reinvestment initiatives in order to subsidize depressed geographic locations (municipalities, cities, states). The accumulated capital is used to sustain local communities that are in some instances to opaque or sparse to receive the highest quality of goods and services a sovereign nation has to offer and present obvious and long standing tax anomalies. 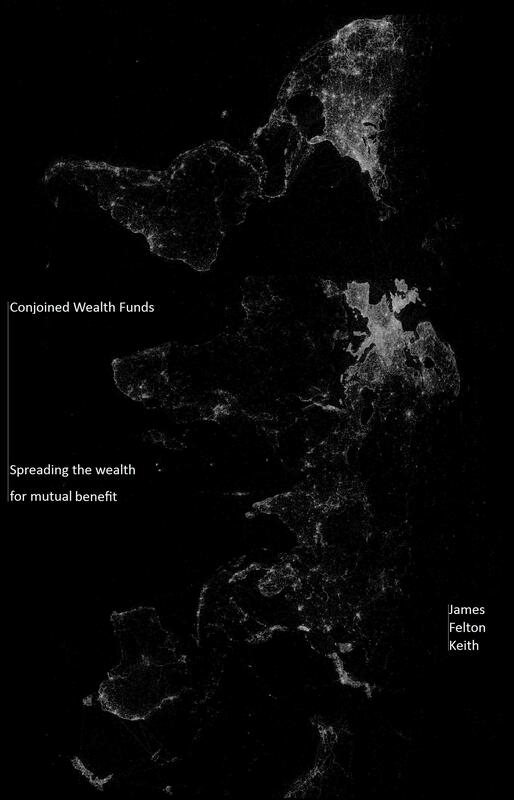 While Conjoined Wealth Funds engage the global equity markets, their core investment focus is assisting the state in the creation and sustainment of self sufficient socio-economic communities and municipalities.